BACKGROUND AND PURPOSE: MCA aneurysms are common and often pose technical challenges to interventionalists. Intracranial stents are widely used in treating wide-neck aneurysms in other locations. To evaluate the feasibility, effectiveness, and safety of stent placement in MCA aneurysms, we performed this retrospective study. MATERIALS AND METHODS: Between October 2003 and May 2009, 16 patients with 16 wide-neck MCA aneurysms were treated with stents at our institution. We retrospectively collected and analyzed the data for these patients, including demographics, morphologic features of the aneurysms, treatment results, and follow-up. RESULTS: Seventeen stents, including 12 Neuroform, 4 LEO, and 1 Enterprise, were successfully deployed in this series. Of the 13 aneurysms treated with stent-assisted embolization, complete occlusion was achieved in 9 aneurysms; residual neck remained in 1, and residual aneurysm was present in 3. Contrast stasis in the aneurysm sac was observed in the other 3 aneurysms treated with stent alone. Procedure-related complication occurred in 1 patient, leading to no permanent effect. The mRS score at discharge was 0–2 in 14 patients and 3–6 in 2. The angiographic follow-up results of 9 patients (mean, 5.6 months) showed that all aneurysms remained stable or improved; there was no in-stent stenosis, recurrence, or retreatment. The clinical follow-up (mean, 20.1 months) demonstrated no neurologic deterioration or rebleeding. CONCLUSIONS: Our preliminary experience demonstrates that stent placement for the treatment of selected wide-neck MCA aneurysms is feasible. However, its safety and efficacy should be further evaluated by larger case series and more adequate follow-up. The MCA is the third most frequent location of intracranial aneurysms, representing approximately 20%.1 In many institutions, surgical clipping is preferred over endovascular embolization for the treatment of MCA aneurysms,2–4 mainly because MCA aneurysms are proximal to the cerebral surface and require less brain retraction to access and expose them. Meanwhile, MCA aneurysms often have wide necks and incorporate branches, which make endovascular embolization unfavorable. Although some recent studies have demonstrated that endovascular embolization is equivalent to surgical clipping for the treatment of selected MCA aneurysms,5–8 wide-neck MCA aneurysms remain technically challenging. Intracranial stent is one of the most promising tools in treating these complex lesions. However, its use for MCA aneurysms is limited.9–12 Therefore, we retrospectively collected and analyzed our data of 16 patients with wide-neck MCA aneurysms treated by either stent-assisted coiling or stent placement alone to evaluate the safety and effectiveness of stent placement for treating this particular lesion. During the past 67 months, from October 2003 to April 2009, 73 patients harboring 73 MCA aneurysms presented to our institution. Of these patients, 16 (7 women, 9 men) with 16 wide-neck MCA aneurysms were treated by either stent-assisted coiling or stent placement alone; they ranged from 39 to 69 years of age (mean age, 49.7 years). Of the 16 MCA aneurysms, 10 were acutely ruptured, 5 were unruptured, and 1 was recurrent. According to the HH Scale, 4 patients were classified as having grade I; 5 patients, as having grade II; and 1 patient, as having grade IV. Several authors (J.L., Y.X., B.H., and Q.H., who had more than 5 years of experience) served as surgeons. Of the 16 wide-neck MCA aneurysms, 2 were located at the M1 segment, and 14, at the MCA bifurcation. The aneurysm size ranged from 1.9 to 10.8 mm. It was ≤3 mm in 3 aneurysms, 3–10 mm in 10, and 10–25 mm in 3. The wide-neck aneurysms were defined as having a large neck (>4 mm) and/or a dome-to-neck ratio ≤ 2. A bilobular sac was noticed in 4 patients. No stenosis of the parent vessel, calcification in the region of the aneurysm, branch vessel incorporation in the aneurysm sac, or partial intrasaccular thrombosis was demonstrated on DSA, CT, or MR imaging. The diameter of the parent vessel ranged from 0.9 to 3.5 mm as measured on DSA images; 3 patients had multiple aneurysms. All patients with acutely ruptured aneurysms were treated within 3 days of admission. All procedures were performed with the patient under general anesthesia and via the transfemoral approach. After systemic heparinization, a 6F Envoy guiding catheter (Cordis, Miami Lakes, Florida) was placed in the distal internal carotid artery. Three types of stents were used to treat these wide-neck MCA aneurysms, including Neuroform stents (Boston Scientific/Target, Fremont, California), LEO stents (Balt Extrusion, Montmorency, France), and Enterprise stents (Cordis). All stents were deployed following the standard procedure recommended by the manufacturer. For Neuroform stent placement, a 300-cm 0.014-inch microguidewire was introduced distally into the M2-M3 segment. The Neuroform stent was advanced over the microguidewire and deployed at the target lesion. For LEO and Enterprise stent placement, a delivering microcatheter (Vasco [Balt Extrusion] for the LEO and Prowler Select Plus [Cordis] for the Enterprise) was first positioned at 2–3 cm over the aneurysm neck; the LEO or Enterprise stent was then loaded into the microcatheter and deployed by withdrawing the microcatheter while stabilizing the delivering wire. Six different therapeutic strategies were used in this series: 1) In the mesh technique (Fig 1), the stent was first implanted to bridge the wide aneurysm neck in 7 aneurysms. The coil microcatheter was then positioned into the aneurysm sac through the mesh of the stent, through which the coils were introduced. 2) In the jailing technique (Fig 2), 3 aneurysms were first catheterized before stent placement. After introducing the first coil (not detached), the stent was deployed to stabilize the microcatheter. Subsequent coils were then introduced into the aneurysm sac. 3) In the Y-configuration stent-placement technique (Fig 3), we planned to use the mesh technique in 1 aneurysm. However, after deploying the first Neuroform stent and during the process of coil embolization, we found that it was difficult to preserve the other MCA branch. Therefore, a second Neuroform stent was deployed in a Y-configuration via the interstices of the first stent. 4) The waffle cone technique was used in 1 patient. A slightly oversized stent with a diameter of 4.5 mm was deployed into the proximal fundus of the aneurysm, which allowed the framing coils to lock into the stent struts and reconstruct the aneurysm neck. 5) In the coil-plus-stent technique, we initially planned to coil 1 aneurysm alone. However, a residual sac and coil protrusion into the parent artery were observed after coiling. Thus, an additional stent was implanted. 6) We adopted the stent-placement-alone technique (Fig 4) in 3 tiny aneurysms, including 2 unruptured aneurysms (1 dissecting) and 1 recurrent aneurysm. We had tried to introduce further coils into these 3 aneurysms but failed. A 39-year-old woman with an MCA bifurcation aneurysm treated with the mesh technique. A, Angiogram shows a small wide-neck MCA bifurcation aneurysm mainly involving the superior branch. B, The microcatheter is inserted into the aneurysm sac through the interstices of a LEO stent to facilitate further coiling. C and D, Postembolization angiogram shows complete occlusion of the aneurysm with patency of the parent vessels. A 58-year-old man with an MCA bifurcation aneurysm treated with the jailing technique. A, Angiogram shows a small wide-neck MCA bifurcation aneurysm mainly involving the inferior branch. B, Two microcatheters (the Echelon-10 [eV3 Neurovascular, Irvine, California] for introducing coils and the Prowler Select Plus for delivering the Enterprise stent) are in position. C, The framing coil is first introduced and then a stent is deployed to compact the coil mass into the aneurysm sac. D, Postembolization angiogram shows complete occlusion of the aneurysm with patency of the parent vessels. A 53-year-old man with multiple aneurysms. A, Angiogram shows a small wide-neck MCA bifurcation aneurysm equally involving 2 branches. B, First, the Neuroform stent is implanted to secure the superior branch. Coils, which endanger the inferior branch, are introduced. C, Second, a Neuroform stent is implanted to preserve the inferior branch, but difficulty is encountered while delivering the stent system through the interstices of the first stent, so the stent is pushed out of the microcatheter to barely secure the inferior branch. D, Postembolization angiogram shows complete occlusion of the aneurysm with patency of both branches. All patients received systemic heparinization after placement of the sheath. The activated clotting time was maintained at 2–3 times the baseline throughout the procedure. Low-molecular-weight heparin (40 mg, every 12 hours, hypodermic injection) was administered immediately after the procedure for 3 days. For patients with unruptured aneurysms, dual antiplatelet drugs (75 mg/day of clopidogrel and 300 mg/day of aspirin) were given for 3 days before the procedure. For patients with acutely ruptured aneurysms, a loading dose of clopidogrel and aspirin (300 mg each) was administered orally or rectally at 2 hours before stent placement. All patients were continued on aspirin and clopidogrel postoperatively for 6 weeks followed by aspirin alone, which was maintained indefinitely. All patients were advised to be clinically evaluated 1, 3, 6, and 12 months after the treatment and yearly thereafter. The postoperative angiographic follow-up was also recommended, including 3-month MR angiography and 6-month DSA. The angiographic results were interpreted independently by 2 authors (P.Y. and Q.H. ), by using the Raymond classification. The characteristics of the 16 patients with wide-neck MCA aneurysms, including patient demographics, morphologic features of the aneurysms, treatment results, and follow-up data, are summarized in the Table. Overall, 17 stents were implanted into the parent arteries, including 12 Neuroform stents in 11 patients, 4 LEO stents in 4 patients, and 1 Enterprise stent in the other patient. Successful stent placement was achieved in all 16 patients, resulting in a technical success rate of 100%. However, we encountered difficulty while delivering the second Neuroform stent through the interstices of the first for a MCA bifurcation aneurysm treated with a Y-configuration stent-placement technique (Fig 3). The diameter of the stents ranged from 2.5 to 4.5 mm, including 4 stents of 2.5 mm, 4 of 3.0 mm, 7 of 3.5 mm, and 2 of 4.5 mm. Of the 13 of 16 aneurysms that underwent coil embolization, 9 were completely occluded, 1 had a residual neck, and 3 had a residual sac. Contrast stasis in the aneurysm sac was observed in the other 3 aneurysms treated with stent alone. Angiographic follow-up ranging from 3 to 9 months was available in 13 patients, with a mean of 5.6 months. One patient died and, therefore, was not available for follow-up. Two patients were not willing to undergo angiographic follow-up for various reasons. Follow-up angiograms showed improved embolization results in 3 aneurysms: One aneurysm treated with stent alone disappeared on 9-month DSA; 2 aneurysms with an initial embolization degree of Raymond class III improved to class I on 7-months and 6-months DSA respectively. The other aneurysms remained stable without recanalization. All parent arteries were patent with no evidence of intimal hyperplasia or in-stent stenosis. One patient died because of severe clinical status (HH Scale grade IV) at admission. The other 15 patients did not experience clinical deterioration during hospitalization in this series. Clinical evaluation was performed in all patients at discharge by using the mRS. Fourteen patients were independent with an mRS score of 0–2 at discharge, while the other 2 were dependent (mRS score, 3–6), including 1 with an mRS score of 4 from a previous contralateral cerebral infarction and 1 with an mRS score of 6 mentioned above. All these patients were followed for 1–67 months (mean, 20.1 months) and none showed any neurologic deterioration. No aneurysm rebled during the follow-up period. 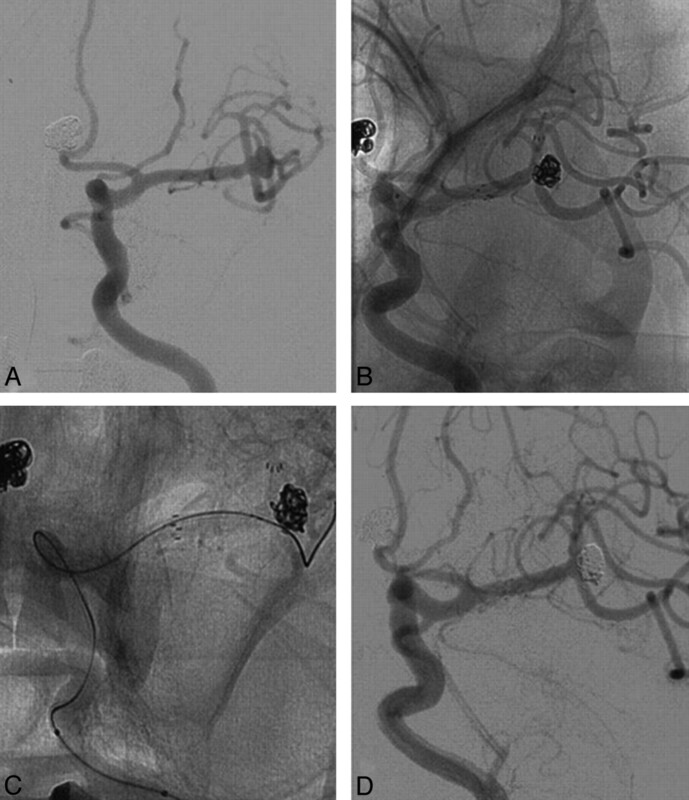 There was only 1 procedure-related complication in this series, a branch obliteration after stent-assisted coil embolization for an acutely ruptured left MCA bifurcation aneurysm with a maximal diameter of 10.5 mm. A Neuroform stent was deployed to secure the inferior branch of the MCA, and a total of 11 bare coils were introduced into the aneurysm sac. The superior branch of the MCA remained patent until the introduction of the 10th coil, while the aneurysm had a partially residual neck. After detachment of the 11th coil, the angiogram showed an obliterated superior branch. However the territory of this branch was compensated by the anterior cerebral artery and inferior branch of the MCA. Fortunately, there was no new neurologic deficit postoperatively for this patient. Thus, there was no procedure-related permanent morbidity or mortality in this series. Although the International Subarachnoid Aneurysm Trial has confirmed the better results of endovascular coiling versus neurosurgical clipping for the treatment of intracranial aneurysms,13,14 which of these 2 modalities is more appropriate for the treatment of MCA aneurysms is still controversial. Few articles have been published with regard to this issue. One of the most important arguments against endovascular treatment is that MCA aneurysms are more likely to have wide necks.15 However, with the rapid development of interventional devices and technologies, various endovascular techniques have been attempted to treat MCA aneurysms with complex morphologic features, including single- or double-balloon remodeling,5,16 coiling simultaneously with double microcatheters,17 TriSpan (Boston Scientific) neck-bridge-device-assisted embolization,18 and stent-assisted embolization.9–12 Among these techniques, self-expanding intracranial stents look the most promising because of their extensive use in MCA stenosis and their effectiveness demonstrated by 4 case reports.9–12 However experience is still limited as far as we know.9–12 To further elucidate the application of stent placement in wide-neck MCA aneurysms, we presented our preliminary 16 cases. Currently, there are 3 types of stents available for treating intracranial aneurysms in China. The Neuroform stent is the first stent designed specifically for the treatment of intracranial aneurysms. It has an open-cell design and cannot be retrieved. The LEO stent is the first stent with a closed-cell design and retractability. The Neuroform and LEO stents are available in multiple diameters and lengths. Therefore, 16 of 17 (94.1%) stents implanted in this series were these 2 types. For aneurysms localized at the MCA bifurcation and involving the 2 branches equally, a Neuroform stent was preferred because a Y-configuration stent placement might be required. Otherwise, for aneurysms localized at the M1 segment or MCA bifurcation mainly involving 1 branch, either stent was acceptable. Generally, when the patient's cerebral vasculature was extremely tortuous, a LEO stent was preferred because it could be delivered more easily into the required position; when there was an acute angle on the parent artery, a Neuroform stent was preferred because its open-cell design made it more conformable to the curved vessel. The Enterprise stent is the third stent introduced in China with a lower profile and better navigability and flexibility, but it is only available in 1 diameter (4.5 mm), which limited its use for MCA aneurysms. There was only 1 patient implanted with an Enterprise stent in this series. The WingSpan stent (Boston Scientific/Target) was originally designed for endovascular treatment of intracranial atherosclerotic stenosis. 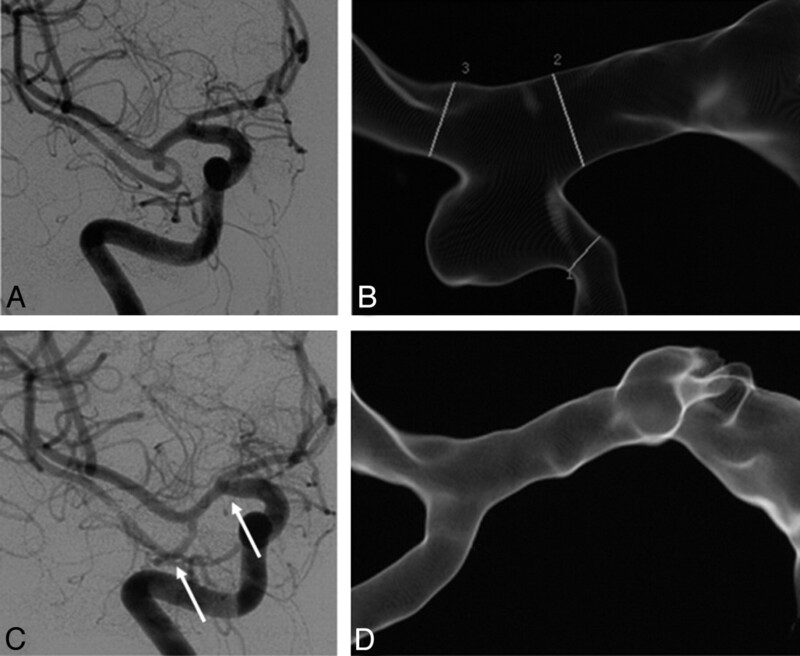 Recently, Yavuz et al19 reported their experience using the Wing span stent to treat wide-neck cerebral aneurysms, including 4 MCA aneurysms. However, we did not try it in this series. The diameter of the stent was decided by the proximal diameter of the parent artery. However, in the acute or subacute phase of patients with ruptured MCA aneurysms, there was moderate-to-severe vasospasm, which might lead us to inappropriate selection of undersized stents.20 In this series, the most frequently used diameter of stents was 3.5 mm, and the minimal diameter was 2.5 mm, even in the vessel with a diameter of 0.9 mm. In this series, 6 different stent-placement strategies were used, including stent placement before coiling (mesh technique, Y-configuration stent-placement technique, and waffle cone technique), stent placement after coiling (jailing technique and coil-plus-stent technique), and stent placement alone. All these procedures were performed in the same session. The mesh technique was the most frequently used strategy (7 of 16). However, sometimes it was difficult to discern if the loops of coil were inside the stent, endangering the parent artery; and for some small aneurysms, it was difficult to catheterize the aneurysm sac through the interstices of the stent. Even if we catheterized those small aneurysms successfully, the microcatheter might be unstable. Therefore, the jailing technique was used in these situations. However, the traditional jailing technique might be accompanied by a higher aneurysm-rupture rate during the process of deploying the stent with a microcatheter in the aneurysm sac. Therefore, we made a modification to this technique—that is, when the aneurysm was successfully catheterized, we first introduced a framing coil partially or fully (not detached) and then deployed the stent. This procedure may avoid the jump of the microcatheter and gain better neck coverage with the framing coil. For MCA aneurysms located at the M1 segment, these 2 techniques were definitely effective. For MCA bifurcation aneurysms mainly involving 1 branch of the MCA, we also tried to deploy 1 stent from that branch to M1, which could cover most of the aneurysm neck and would make the uncovered part on the other branch become relatively narrow, to avoid coil protrusion. However, for MCA bifurcation aneurysms involving 2 branches equally, the mesh and jailing techniques were not adequate to preserve both branches. The Y-configuration stent placement and waffle cone technique could be options. 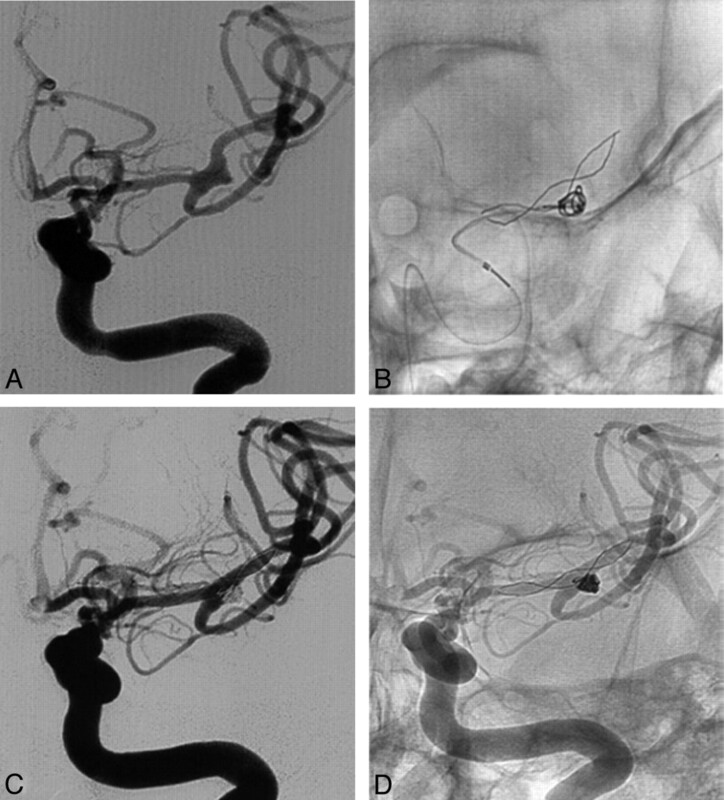 The Y-configuration stent placement was originally introduced for treating basilar apex aneurysms.21 It could also reconstruct the MCA bifurcation, effectively verified by 1 case presented here and another case previously reported by Sani and Lopes.10 However, the potentially increased thrombogenicity was a major concern for this technique due to double-stent placement. Therefore, the waffle cone technique was performed, aiming at protecting both incorporated branches with a single stent.22 Nevertheless, there were disadvantages for this technique, such as the risk of aneurysm rupture during the process of deploying the stent and a potentially higher rate of recurrence because of diversion of blood flow into the aneurysm by the stent. Thus, for these MCA bifurcation aneurysms, we preferred Y-configuration stent placement rather than the waffle cone technique. For 3 tiny aneurysms unable to be coiled in this series, stent placement alone was performed. DSA showed complete obliteration of 1 aneurysm at 9 months, which was also reported for a large fusiform aneurysm located at the M1 segment by Pumar et al.11 However, we were still concerned about the delayed thrombosis of the aneurysm sac using this technique. During that delay, the stented aneurysms could rupture at any time and might be further aggravated by combined antiplatelet therapy. Furthermore, there was also an unplanned stent placement in this series. There was a residual filling after coiling alone and/or coil protrusion into the parent artery; an additional stent was needed to promote the thrombosis of the aneurysm and/or salvage the parent artery, which was defined as the coil-plus-stent technique in this article. In the present series, we reported 16 cases with a procedure-related complication rate of 1 of 16 and without procedure-related permanent complications, which was comparable with both surgical clipping and coil embolization of MCA aneurysms.8 Our results were also consistent with those of stent placement in wide-neck intracranial aneurysms at other locations.23,24 During the 1- to 67-month clinical follow-up, all patients remained neurologically stable; this finding indicates that no rebleeding occurred in that period. The immediate complete occlusion rate of this series was 9 of 13, which was also similar to that of coiling alone.8 During the angiographic follow-up, the embolization degree of 2 aneurysms improved dramatically, and there has been no in-stent stenosis, recanalization, or retreatment in this series so far. All these data suggest that stent placement in MCA aneurysms seems to be safe and effective. 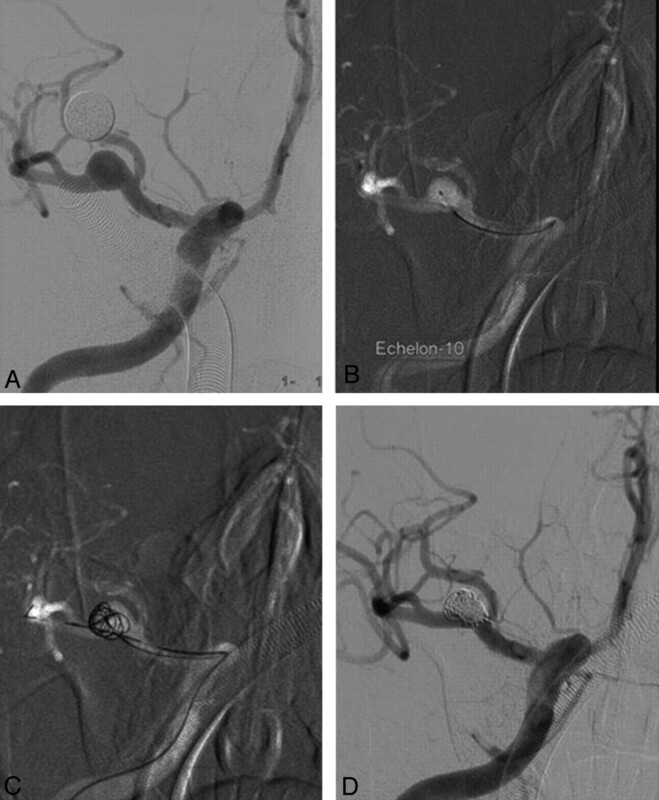 Previously published articles have already demonstrated the feasibility, safety, and efficacy of coil embolization for the treatment of MCA aneurysms.5–8 This series has also presented encouraging results, which showed that complex MCA aneurysms could be treated safely and effectively via an endovascular approach. Meanwhile, with less invasion and the ability to treat multiple aneurysms in 1 session, the endovascular treatment of MCA aneurysms may be gradually favored over surgical clipping in the future, especially for unruptured aneurysms and aged patients. The protocol of pretreatment with an antiplatelet regimen for patients with acutely ruptured aneurysms is still controversial. Considering the inherent thrombogenicity of stent placement and the potential for severe rebleeding after antiplatelet therapy, we administered these antiplatelets very shortly before stent placement, a procedure advocated by some other authors.23,24 However, Katsaridis et al25 reported that stent-assisted coiling without any pretreatment is safe in ruptured and unruptured aneurysms on the basis of experience in 54 cases. Therefore, further study is required to evaluate the benefit-risk balance for different protocols. There are some limitations to this study, including the retrospective design, patient-selection bias, limited cases in 1 institution, and the inadequate angiographic follow-up. However, to our knowledge, this is the largest series for stent placement in MCA aneurysms to date. Our preliminary experience demonstrates that stent placement for the treatment of selected wide-neck MCA aneurysms is feasible. Various stent-placement strategies could be considered for this particular lesion. Further studies with a larger number of cases and adequate follow-up are required to verify its safety and efficacy and to evaluate its long-term results. This work was supported in part by the Key Project from the Shanghai Committee of Science and Technology (074119506) and Shanghai Municipal Natural Science Foundation (08ZR1404200). Accepted after revision September 17, 2009.